NASA has called out students from all over the world to help in creating the prototypes of next Mars Rover. NASA organised a contest where team of students from various universities and colleges participated to build various models of what could be the next Mars Rover in Mars mission. Students are the best candidate for inventing something unique. Students can quickly correlate what they learn in school or college into its practical form. A combination of classroom studies, hobbies and a desire to create something new is the motive that brings the students and the faculty together. One would have to see it to believe it. An Xbox controller is being used to steer a model Mars Rover. This is not a video game but something real. The bright students have designed and assembled their very own robotic rover to compete in a contest being held this week at NASA’s Johnson Space Center in Houston, Texas. The competition is sponsored by NASA and the National Institute of Aerospace. The competition is known as the RASC-AL Exploration Robo-Ops Competition. 8 teams are in the race and are composed of undergraduate and graduate students from UB, the Massachusetts, Institute of Technology, the University at California, Berkeley and other schools. The teams were asked to design a Rover which could tackle a series of obstacles at the NASA Johnson’s Rockyard, a test area which tries to mimic the conditions on Mars. The Robotic Rovers have to complete a series of tests and it includes climb a 30-degree slope, cross sand and gravel pits, and collect rock samples up to 8 centimeters. The team can send 3 students and an adviser from the faculty. However, the rover will have to be operated by remotely by the students. The contest sets limitations in the dimensions of the rover. The rover must be 1 meter long, 1 meter wide and ½ meter tall. The UB Space Bulls had included 16 engineering and communication students in its team and had sent the commands through the Web from North Campus. However the rover flipped over spilling the contents of rocks it carried. The UB team was disqualified in the last day of the competition. The UB designed rover featured a four wheel drive, independent suspension system on each wheel and tank style steering. 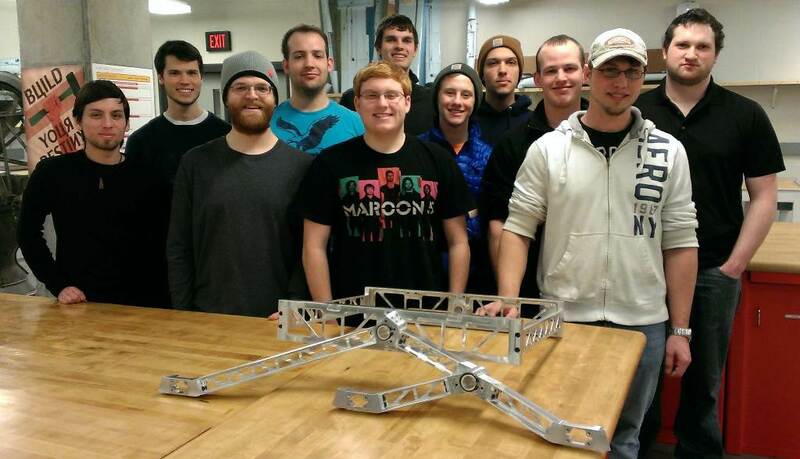 Most of the components were purchased from the shelf, the suspension, wheels and mechanical arm were fabricated by the students at the UB engineering lab with a 3-D printer. Four cameras on the rover relayed live footage between UB and the NASA center. The team was advised by Kevin Burke and Jennifer Zirnheld, both assistant professors in the Department of Electrical Engineering. Each team will pocket $10,000 to cover travel expenses, equipment purchases and software. The top three winners get a cash prize of $6,000, $3,000 and $2,000, respectively.